Get the door. It's the most delicious looking game we've seen. If we awarded video games five stars solely based on their ability to make us hungry, Domino's Pizza Hero would easily achieve a perfect score. Equal parts game, marketing tool and job application, this free-to-download app is right there to help you choose a new career, order pizza and even make them yourself. Is it fun? No, of course not. OK, a little. Yes, you can apply for a job and make an order. 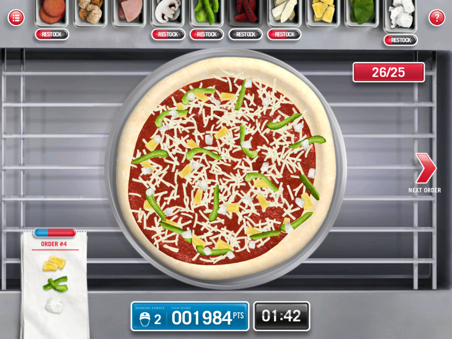 That aside, the game sends you to a virtual kitchen to learn how pizza is made, walking you through all the steps, from kneading the dough to adding sauce, sprinkling cheese, piling on the toppings, poking bubbles inside of an oven and then cutting the sucker into eight equal pieces before shipping it off. 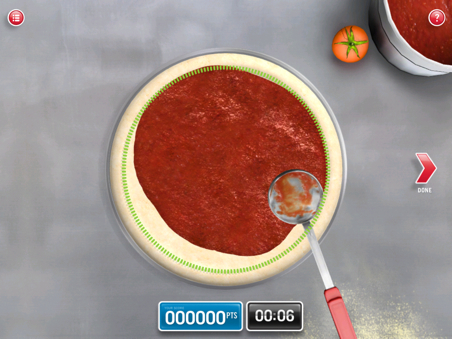 At first, we expected this to be laughable at best, but the developers did a good job with the game's limited special effects, especially when it comes to manipulating the dough and pouring the sauce, both of which react somewhat realistically; the dough even shrinks shortly after kneading. To that end, the goal is to make as many pizzas as possible until you A.) fail, or B.) pass out from boredom, and either one will happen eventually. 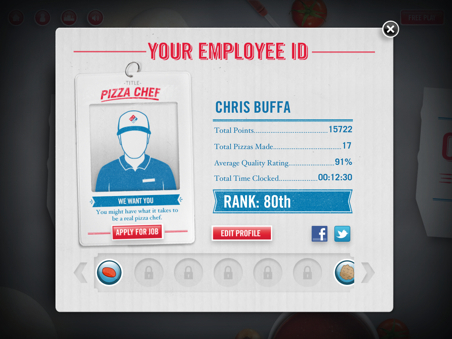 Pizza Hero is surprisingly difficult, with a steep learning curve when it comes to mastering mozzarella. Sprinkle too much, fail. Sprinkle too little, fail. Meanwhile, the manager mostly complains, so much so, that we felt a great sense of accomplishment when we did something right. Meanwhile, the toppings mini-game drives us nuts. Eventually, you run out and must restock more, which takes forever, not exactly an ideal situation in a game that times your progress. There's nothing worse than needing one more piece of pepperoni to advance, only to lose because of restocking. Mushrooms? Sausage? Didn't you hear? We need pepperoni, dammit. As for brain fatigue, we don't expect you to play this one very long since the game lacks variety. You just sit there making pizzas while coming under fire from the boss. Come to think of it, this sounds like an actual part-time job. That said, the pizzas look delicious, and we've had them on the collective brain the past 24 hours. If selling more pizzas was the primary goal, Dominos succeeded brilliantly. As for the actual gameplay...a bit uncooked. What's Hot: Makes us hungry, cutting pizza is oddly enjoyable, delicious graphics, options to apply for a job and order pizza. What's Not: Extremely repetitive, annoying manager, a surprise learning curve.